After reading Chrissie Wellington’s memoir I feel like I know her personally. The four time Ironman World Champion is candid about subjects that many people would be more comfortable avoiding (including eating disorders and diarrhea). The amazing thing about her story is that she was much more of a bookworm than an athlete growing up. When I think of professional athletes I think of people with a natural ability who have been excelling from an early age. 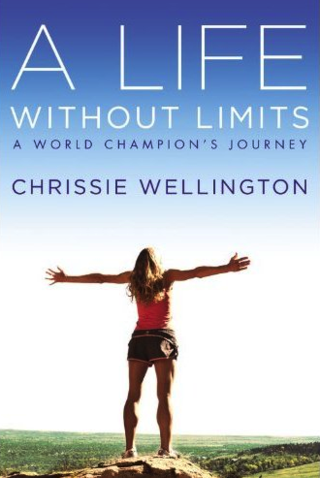 Chrissie Wellington did not pursue professional triathlons until she was thirty years old. Her humble athletic background and late start give her a Cinderella-esque quality that I love`. She talks in detail throughout the book about the mental toughness that it took to be able to make it through all aspects of the Ironman (training sessions, particular races when problems arose, missing her family, a less than receptive welcome). I can’t imagine anyone not respecting her mentality and I loved learning more about what she was thinking and feeling throughout her journey. Overall, I thought this book was a great easy read, and I feel like I learned a lot from it. There were sections of the book that seemed a little irrelevant, but who am I to judge someone else’s experience. This entry was posted in Book Worming It and tagged A Life Without Limits, Chrissie Wellington, Ironman, Quotes, Triathlon by sparklesandsweat. Bookmark the permalink.